Trainwreck Architect is a unique sounding metal band from Montreal. A group who blend the New Wave of British Heavy Metal with thrash and some elements of death metal there is something strangely addictive about these guys sound. No one else in the world really is doing what Trainwreck Architect is doing and that's possibly just because there approach is so distinctly singular no other group of musicians would be capable of really imitating it. You see, Trainwreck Architect use cleans and growls, yet they flow together in a way that you hardly notice the combination. It just feels pure and natural. 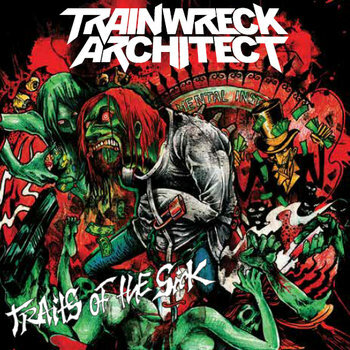 The approach that Trainwreck Architect have to their music is powerful and distinctive, it reaches out and touches the listener with its honesty. This is what these guys were born to do and no one will stop them from reaching their total heavy metal dominance. Suffice to say the future seems bright for these guys and I could see them and their unique sound going far. If you want to hear more of their unclassable metal madness be sure to check out their new record Traits of the Sick!